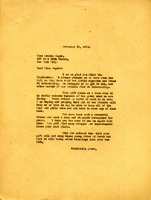 Letter to Louise Kager from Martha Berry informing her that she was glad that she enjoyed the Highlander. Miss Berry informs her that they struggle to put it out and often wonder if their friends even find it interesting. She also informs Miss Kager that her gift comes at a perfect time because they are struggling so much and learning to appreciate every dollar. She also hopes that they won't have to send any boys and girls home this year. Miss Berry also hopes that she will come for a visit and maybe find the school much improved since her last visit. In conclusion, she thanks her gain for the gift and wishes blessings in her life as well as on the boys and girls attending the schools.